"The Food and Drug Administration (FDA) is proposing to extend the compliance dates by approximately 1.5 years for the final rules providing updated nutrition information on the label of food, including dietary supplements; defining a single-serving container; requiring dual-column labeling for certain containers; updating, modifying, and establishing certain reference amounts customarily consumed (RACCs); and amending the label serving size for breath mints," the agency announced. "We are taking this action because, after careful consideration, we have tentatively determined that additional time would help ensure that all manufacturers covered by the final rules have guidance from FDA to address, for example, certain technical questions we received after publication of the final rules, and that they are able to complete and print updated Nutrition Facts labels for their products before they are expected to be in compliance with the final rules," the FDA said. The Obama administration said its reason for changing the Nutrition Facts label was for Americans to "make more informed food choices." Making calories physically larger than the rest of the contents on the label was the recommendation of a federal "Obesity Working Group." The first regulation stated, "Attention to calories is highlighted by the substantially increased font size of the calorie declaration per serving of a product." A second regulation, also released by the Obama FDA on May 27, 2016, addressed the "serving size for breath mints." The government decreed through the regulation that mints should be labeled by the "new serving size of 1 unit." "We proposed this action in response to a petition that suggested the appropriate serving size for small breath mints should be ‘one mint' instead of the number of pieces that is closest to the 2 g [Reference Amounts Customarily Consumed] RACC," the regulation stated. "[W]e will now require that the label statement for the serving size of all breath mints be 1 unit, rather than declaring the serving size in terms of the number of mints closest to the 2 g RACC," the FDA said. Peppermints typically contain 2 calories. In addition, the government recommended "chocolate squares, butter mints, and similar products" be included in the FDA's "after-dinner confectionaries" product category for calorie labeling. The regulation also determined that Alfredo sauce should be categorized as a "minor main entrée sauce," which should be labeled using 1/4 cup as the standard serving size. "Consumption data for Alfredo sauce is consistent with other products in the minor main entrée sauces product category," the regulation states. "While some may use Alfredo sauce in the same manner as tomato sauce, others use Alfredo sauce in the same manner as pesto sauce, which is also in the minor main entrée sauces product category. Because this product can be used in either way, we must rely on consumption data, which shows that people are typically consuming less Alfredo sauce than spaghetti sauce." 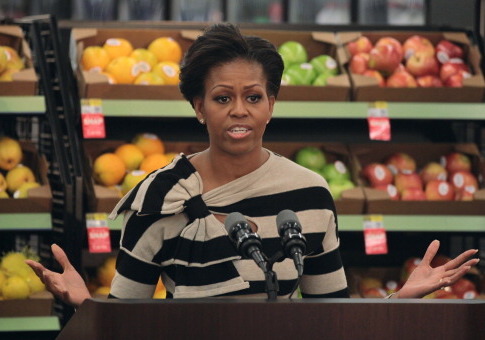 Michelle Obama's Nutrition Label received criticism from a number of food scientists who said the government used misleading research to justify including added sugars on the new label. The rationale for "added sugars" was based on the 2015 Dietary Guidelines, a government committee that did not include a single expert on sugars. Other research from the Institute of Medicine and the European Food Safety Authority "concluded that added sugars are not uniquely linked to obesity, cardiovascular disease, or diabetes." A number of Mrs. Obama's initiatives as first lady have been cut back or delayed under the Trump administration. The Department of Agriculture is giving schools more flexibility and more salt in their school lunches, breaking from the former first lady's healthy lunch rules. The administration also ended Mrs. Obama's "Let Girls Learn" education campaign. The regulations were set to go into effect for food manufacturers with more than $10 million in annual sales on July 26, 2018. Those manufacturers will now have until Jan. 1, 2020. This entry was posted in Issues and tagged FDA, Michelle Obama. Bookmark the permalink.